At Dewey’s Pizza located in western Lakewood, there is a new pizza in town. The Tito Santana, a taco styled pizza, has returned for the spring season. A seasonal specialty pizza, the Tito Santana is not only a customer favorite, but also a staff favorite pizza. As a cook in the kitchen, I can first-hand say that it is by far the favorite seasonal pizza by my fellow cooks. 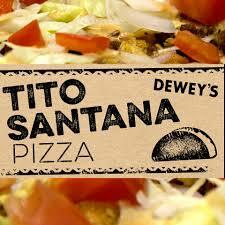 The Tito Santana differs from the traditional Pepperoni Pizza. Instead of using a tomato pizza sauce red sauce the Tito uses a taco sauce as the base. This base gives the Tito a different taste from any other pizza. After the sauce, the Tito receives a mixture of Chihuahua and Cheddar cheeses. Chihuahua is a Mexican white cheese, is often found in Queso. The mixture of the two forms a Mexican cheese blend that is often identified in American made taco dished. Once the cheese has been applied, red onions are added to give a little taste, followed by an even amount of taco meat. The taco meat is seasoned ground beef, and with the rest of the ingredients, it forms a very tasty pizza. To finish off the pre-baking ingredients, the Tito gets a lite topping of Frito chips, which reminds the customer of a hard taco shell. When the pizza is finished being topped, it is then launched into one of Dewey’s four ovens. First the bottom is cooked for a minute. After the minute timer goes off, the pizza is then screened, and cooked for up to three or four more minutes. Finally, the Tito receives an after-bake of shredded lettuce, diced-tomatoes, and chipotle-ranch dressing. Come in and get your Tito Santana before it is too late!